In the world of mobile games mediocre design, microtransactions, rip-offs, and cheap cash-ins flood the market and leave a certain stigma that often turns gamers away. 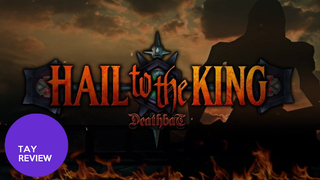 The guys in Avenged Sevenfold and the folks at Subscience Studios sought to fight against that trend with the newly released Hail to the King: Deathbat, an action RPG game inspired by the art and music of Avenged Sevenfold. Several bands have created mobile games before, but they have all be cheap and boring cash-ins to try and make a bit more money. Avenged Sevenfold frontman M. Shadows, who served as the lead designer on Deathbat, set out to create a true gaming experience made for gamers inspired by the games he grew up playing such as The Legend of Zelda, Super Mario Bros. and Castlevania. The result was Hail to the King: Deathbat, a game that pushes the limits of mobile gaming and feels almost like a console game. Hail to the King: Deathbat is a challenging game. You can't just hack and slash your way to the end of each level. You need to take time to figure out how to progress. At first glance it can be easy to miss a hidden path or a lever. One level had me going in circles for a while searching for the last of three levers to open a gate so I could proceed to the next section of the level. There are also times where you will get mobbed with enemies and quickly killed if you aren't careful. You will need to think quickly on your feet and try to pick them off one by one instead of charging in mindlessly swinging your weapon around. It's this kind of challenge that keeps Deathbat fun even if you get stuck or keep dying. The sense of satisfaction at overcoming a difficult section of a level is its own reward. Deahbat has a wonderful art style pulled right out of the album covers and booklets of Avenged Sevenfold's albums. Eerie graveyards, undead warriors, and of course tons of skeletons. The levels are also inspired by various hit songs from the band. There's a evil church/graveyard level inspired by the band's early hit "Unholy Confessions," you get to fight through the demon infested city of Babylon from "Beast and the Harlot," and travel the bat-ridden deserts and caves of "Bat Country," the band's breakout single. This game truly captures the essence of Avenged Sevenfold. The guys in Avenged Sevenfold composed a fantastic soundtrack for this game. Instead of the band's typical metal style, the soundtrack for Deathbat is reminiscent of old school game soundtracks like those in Zelda in Castlevania. The soundtrack blends 16-bit melodies and symphonic instruments with the evil and eerie feel often present in Avenged Sevenfold's music to create some some very memorable music that keeps getting stuck in my head. And of course what would an Avenged Sevenfold game be without some Avenged Sevenfold songs? In addition to the original score, Deathbat also includes instrumental versions of hit songs from the band that pop up during boss fights and some cutscenes. It feels awesome to battle against bosses to great songs such as "Nightmare," "Unholy Confessions," and "Bat Country." Deathbat has a decent story but it's nothing special either. Two of the three gods believed that good would always triumph while the third, Kerberos, believed that creatures with free will would always give into evil desires. So the gods decided to make a wager. They created the world of Haides and populated it with various creatures of both good and evil. They then bestowed unto the world a talisman of ultimate power. Whoever wielded the talisman was granted unimaginable power. The world was plummited into chaos as various men and demons fought over the Talisman but out of the darkness rose a great warrior named Andronikos who sought to rid the world of evil. Slowly but surely he defeated the forces of evil and was made king. Not wanting to lose the wager, to absolutely no one's surprise Kerberos interfered and killed Andronikos, replacing him with an evil version. He then broke the Talisman into pieces and gave the shards to various forces of evil, descending Haides into darkness once again. The other two gods then resurrect Andronikos as the Deathbat and send him to thwart Kerberos and defeat the forces of evil that have overrun the world of Haides. As the Deathbat, it is your goal to defeat the evil that plagues Haides, reclaim the pieces of the Talisman, and use its power to challenge Kerberos himself. The Witch lives in the Crypt, the central hub for Hail the King: Deathbat. You will be coming back to her after every level to stock up on potions and other power-ups as well as to purchase new weapons that deal more damage. You will need both of these in order to make any kind of progress. To pay for weapons and items you must use the coins you've collected along the way. The most essential things to get are health potions. Without health potions you will be dying a lot. You can only carry a limited number of each potion so you need to use them sparingly and save some for boss fights. It is also a good idea to save up your coins so you can purchase a good weapon. The enemies in each level do more damage and are harder to kill than those in the previous level so you will need a good weapon if you don't want to die constantly. You can also purchase extra lives and upgrades that increase the size of your health and magic bars. Be wary of these upgrades because you will lose them if you run out of lives. Combat in Deathbat is pretty simple due to it being a mobile title. You can attack with your equipped weapon or use a magic attack. Each weapon has its own magic attack that goes with it such an a fireball or an lightning ball. You can also hold down the magic button to fire a more powerful charged attack. Magic is your ranged attack while your weapon is more reliable than magic at close range since you don't need to aim. There isn't much variety in terms of combat. You just hit the enemies until they die and try to avoid getting hit by them. The best way to do that is it hit them before they can hit you. If you hit them there is a chance they will be knocked back. Chances are you are going to take a few hits. I would have liked some sort of simple block capability like the shield in Zelda but I understand that that they were limited in the mobile space. Boss fights are where things get a bit more interesting. Much like a Zelda game, each boss has its own unique pattern or attacking that you need to learn. Once you figure out the pattern you can figure out the best times to attack so you can slay the boss. Each level typically has two mini-boss fights and a final boss at the end. There are collectibles hidden throughout the various levels in Deathbat. There are hidden chests that hold pieces of the Book of Mortals. There isn't much reason to get them other than achievements and bragging rights. There are also three hidden bats in each level. If you collect all three you are able to access that level's bonus level which is just a small little level that gives you a ton of coins and a page of the Book of Mortals. Each bonus level also has a short minigame where you fly after a little green creature and shoot it to make it drop coins. There are several achievements in the game but they aren't really worth it. There's not really any sort of bonus for achieving all of them and some of them are super hard such as completing the game without dying at all. The game is very hard and it is almost impossible to not die at least once. You have to be a real sucker for punishment to even considering getting the achievement for completing the game on the unlockable Nightmare mode without dying. The controls for Deathbat are pretty touch-and-go. On the right side you have you melee and magic buttons and on the left there's a virtual D-Pad. You touch any part of the left side of the screen and move in the direction you want to go. There is also the menu button on the top as well as a button you can map a potion to for quick use. The implementation itself is pretty solid but there were a few noticeable issues. I found it very easy to accidentally hit the magic button instead of the melee button because they are just a bit too close together. The potion button is also a bit too small and it can be sometimes hard to press it. It is quite frustrating to die because you couldn't use your health potion in time due to not being able to press the button. It is essential to keep your fingers and screen clean otherwise you will have a hard time with the controls. The one major complaint I have with Hail to the King: Deathbat is that it can be too punishing at times. Sometimes enemies will be able to hit you no matter what you do and will destroy your health way too fast. There are also tons of instances with moving spikes and guillotines and fireballs and rolling spikes that are very hard to avoid. There is also a distinct lack of health pick-ups. Enemies will frequently drop magic replenishing pick-ups when they die but it is almost impossible to find anything that restores your health. You will be dying a lot and when you run out of lives you have to start over from the beginning of the level and you lose any health or magic upgrades you may have purchased. You will become all too familiar with the game over screen. You will not make any progress if you don't buy as many health potions as you can carry. You are going to be spending a lot of time replaying the same levels over and over because you keep dying or in order to grind up a ton of money so you can buy potions and better weapons. The best thing you can do is to buy the best weapon the Witch has for sale as soon as possible. This will make your life much easier but you will still find yourself getting frustrated at times. Hail to the King: Deathbat is definitely worth checking out even if you aren't a fan of Avenged Sevenfold. If you were looking for a more in-depth and expansive game to play on your phone or tablet than the typical mobile offerings, then check out this game. Deathbat is a mobile game for gamers. It's challenging and has an old school game feel that will definitely keep you satisfied.